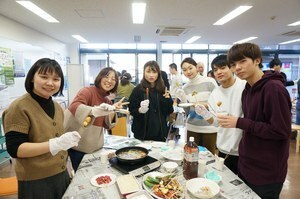 “HAPPY NEW YEAR 2019！Cooking with President, New Year Special” was held at the Global Village in the Sugimoto Campus during lunch time on Tuesday 8 January. It was the 6th “Cooking with President” held in this campus. 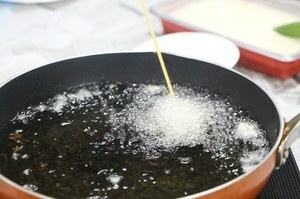 The theme this time was “Specialty Dish of Osaka”. 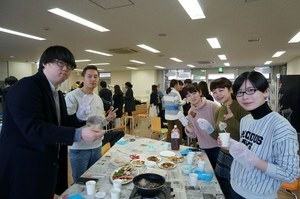 Okonomiyaki, Japanese style pancakes or pizza and kushikatsu, deep-fried meat or vegetables on a stick were prepared and served to our international students. After President Arakawa himself demonstrated how to deep-fry kushikatsu, everyone in each table enjoyed kushikatsu with different ingredient. The international students appreciated the specialty dish of Osaka as it was the first time for many of them to try this kind of dish.